Florida Power and Light (FPL) is reopening the application period for solar rebates on May 3, but interested customers must act quickly as the first-come, first-serve funding is expected to run out almost immediately. FPL is offering up to $20,000 in rebates for solar electric systems (PV) and $1,000 for solar water heaters. take advantage of solar rebates on offer May 3, 2012. Although the solar water heating rebates are smaller, solar thermal technology is less expensive than PV systems and customers will reap savings immediately. According to the Florida Solar Energy Center, a solar water heater can cut a family's water heating costs by up to 85 percent. As part of a five-year pilot program authorized by the Florida Public Service Commission, FPL is offering $1,000 for every new residential solar water heater. The rebate is available to all existing FPL residential customers with electric or gas water heating. Under the same pilot program, solar electric systems can qualify for$2 per watt of DC output of a PV system, up to $20,000. 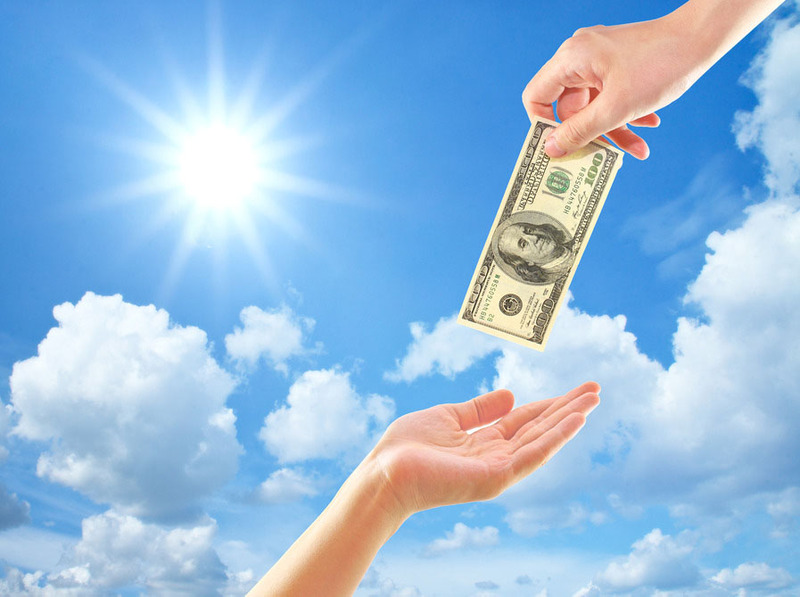 The rebates are not available for new construction or PV systems that are already installed. Applicants must be current account holders of the premise where the solar photovoltaic system is being installed. The Residential PV rebate is for solar electric panels, mounting hardware, grid-interactive electric inverter(s), optional battery systems, associated cabling, and for systems over 10 kilowatt AC, disconnect devices. This rebate program is only for grid-interactive PV systems with a minimum nameplate rating of 2 kilowatts direct current (DC) and a maximum nameplate rating of 2 megawatts. All components must be tested and listed by a nationally recognized testing and certification laboratory for continuous interactive operation with an electric distribution system in compliance with the applicable codes and standards of IEEE 1547, IEEE 1547.1, and UL 1741. All products installed must be new, not refurbished or previously installed. UMA Solar distributes Solene solar hot water systems and Heliolectric solar electric systems, both of which qualify for the FPL rebate as well as federal incentives. To find a solar contractor qualified to install these systems in your area, visit the Solene and Heliolectric websites. 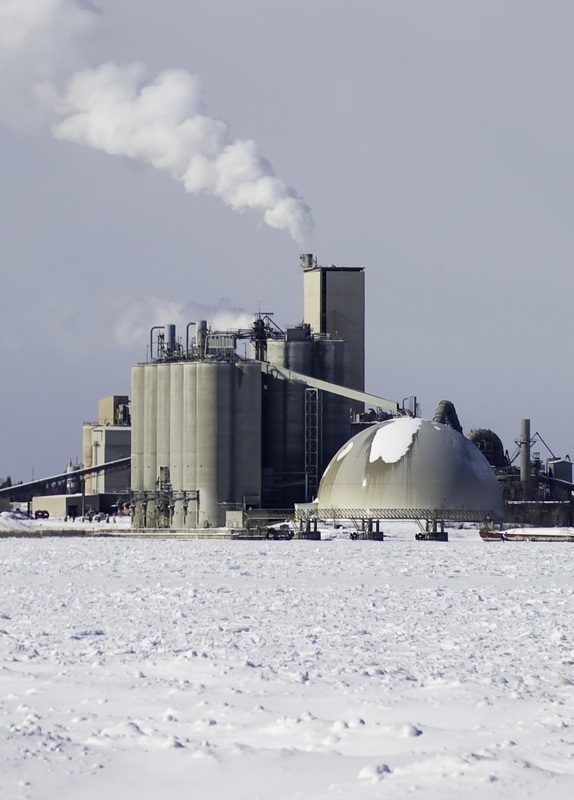 Cement production is one of the largest emitters of greenhouse gases, second only to coal-powered electricity. More than 3 billion tons of cement was consumed globally in 2010 alone, the production of which caused environmental damage at all stages including airborne dust and gas pollution and injury to land areas from quarrying. St. Mary's Cement Plant, Charlevoix, Mich. But according to a recent study in Chemical Communications, researchers from Virginia's George Washington University have developed a method for cement production that relies on solar thermal heat to eliminate CO2 emissions. The scientists believe the process will also be cheaper than current production techniques. The research team explained that 60 to 70 percent of CO2 emissions during cement production occur during the conversion of limestone into lime. CO2 is a byproduct of the conversion process. The remaining emissions come from burning fossil fuels to heat the reactors used during the conversion. The new method would eliminate CO2 from both processes using solar thermal technology. First, solar heat would assist in an electrolysis method of separating the lime from the limestone. Instead of producing carbon dioxide, as in current methods, the new process would produce only oxygen and graphite. The graphite could be stored as solid carbon, researchers said, and by separating it from oxygen atoms, it no longer poses a threat to the atmosphere. Solar thermal heat would additionally replace the fossil fuel heat sources currently in use. The study estimates that the new method could also be cheaper than current lime production techniques because carbon monoxide produced during the high temperature reaction can be sold and used in other industries. As an added benefit, researchers said the new solar thermal method isn't limited to cement production. Any industrial application that converts limestone to lime, such as purifying iron, producing glass, paper and sugar, softening water and removing phosphates from sewage, can take advantage of the technology. A whopping 89 percent of Americans think it's important for the U.S. to develop and use solar power, according to a research survey published by the Solar Energy Industries Association (SEIA). For the fourth consecutive year, the survey found that about nine out of 10 Americans strongly favored solar energy. The statistics are particularly telling in this fourth year, however, because the survey took place following the much publicized Solyndra bankruptcy. Further research from SEIA predicts America's love affair with solar energy will continue over the next two years. The association says some analysts predict the U.S. will become the world's largest solar market by 2014. In addition, solar is already the fastest growing energy sector in the U.S. and will likely be the largest source of new energy capacity in America by 2014. Take a look at UMA Solar's detailed infographic to learn more about American support of solar energy. 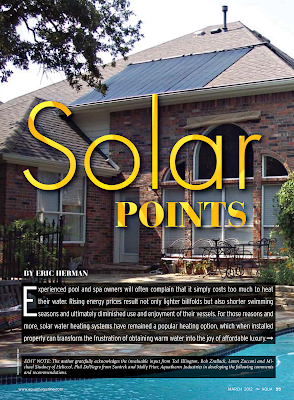 A recent article in the March 2012 digital issue of AQUA Magazine highlights solar pool heating with heavy input from our industry-wise Heliocol solar pool heating staff. Kudos to Director of Marketing Tod Ellington, Vice President Bob Zrallack, National Sales Manager Loren Zucconi and Senior Professional Engineer Michael Studney for sharing their considerable solar industry knowledge with AQUA Magazine readers. Experienced pool and spa owners will often complain that it simply costs too much to heat their water. Rising energy prices result not only lighter billfolds but also shorter swimming seasons and ultimately diminished use and enjoyment of their vessels. For those reasons and more, solar water heating systems have remained a popular heating option, which when installed properly can transform the frustration of obtaining warm water into the joy of affordable luxury. 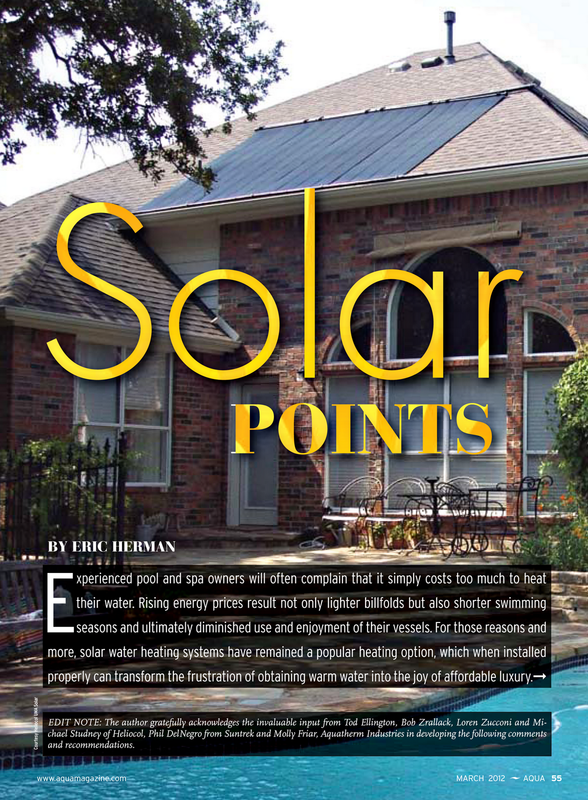 A recent article in AQUA Magazine outlining the benefits of solar pool heating systems. The notion of harnessing the sun’s energy to serve our earthly needs in the form of a ready and renewable energy source is hardly anything new. There’s an inescapable logic to utilizing the inexhaustible source of energy that is our sun in favor of burning fossil fuel. And as energy prices continue to rise, the appeal of heating water for pools and spas in particular using the sun becomes more and more enticing for many consumers who want to both save money and extend their swimming season without their lips turning blue. And for those concerned about “going green” it doesn’t hurt that solar heating leaves virtually no carbon footprint. That’s all been good news for solar manufacturers, who currently report that even through the tough economic conditions of the past four years, the market for solar heating, both on the residential and commercial sides of the market, has remained steady and has even made inroads in places they wouldn’t have expected. Even homeowners in areas such as the upper Midwest and Northeastern U.S., regions considered less likely to turn to solar to due their colder climates, have embraced solar heating. Despite the ironclad logic behind solar thermal heating systems, successfully applying the technology does require hitting a handful of key technical concepts as well as governing client expectations. Here are a few of the main issues that need to be addressed in order for consumers to enjoy the limitless bounty of the sun’s free energy. The good news is that all of these points boil down to basic common sense and when presented to clients in the right light, solar heating becomes more appealing and attainable. Those who install solar heating systems must be part plumber, roofing contractor and electrician. That’s why manufacturers strongly recommend that homeowners turn to qualified dealers to size and install their systems and not take on the challenge themselves. relative to the flow requirements of the solar panels, as well as resistance provided by vertical lift to the panel locations. And the plumbing connections need to be properly installed to avoid leaks. On the electrical side, solar systems require connections to automated valves and heating control systems. Again, although not complex by any stretch, those connections require an understanding of basic electrical installation techniques and hardware. And finally, rooftop installations require making small numbers of penetrations to secure panel-mounting hardware. Proper use of sealants and flashing is therefore critical to avoid leaks. For these basic reasons, solar pool heating should not be viewed as a do-it-yourself proposition. expect from their systems in terms of performance. They need to first understand that solar heating systems operate when the sun is out and therefore it’s necessary to circulate their pool’s filtration systems during the day, as in the vast majority of cases, the solar system will run off the primary circulation pump. temperature rise — which in pools will typically top out at about 90 degrees. Depending on ambient temps and other variables, solar heating systems may take two to three days or longer to generate desired water temperatures. it over time. By contrast, a client who wants temps in the high-80s and lives in a cooler climate can also achieve that, but it will take longer to raise the temperature to the desired level. as the cooling effect of rainfall and the required time needed to reheat the water. In most cases, clients are surprised by what they can achieve in terms of heat rise and maintenance, so long as they’ve been properly informed about the realistic limitations of their systems. impacting return on investment include cost of heating in the area, the size of the pool, desired temperature and, of course, prevailing climatic conditions. Clients who have used fossil fuel to heat their pools can easily calculate the savings — and the numbers are typically impressive enough to motivate serious interest in obtaining a system. As a general rule, manufacturers report that in the vast majority of situations, the systems repay their initial costs within two years. By contrast, perhaps the most vexing client concern involves the appearance of the panels themselves. Because they do consume significant surface area and are typically installed on roofs, the panels are quite visible. Some suppliers now offer panels in different colors that help blend with roof material. Beyond that, the message to consumers is that most people come to see the panels in the way they see a satellite dish, television antenna or even power lines. They simply become part of the accepted scenery. And when the cost savings and increased enjoyment of the water is factored in, the appearance of the panels becomes far more forgivable and even potentially a point of pride. Manufacturers size solar systems based primarily on surface area of the water rather than volume, based largely on the fact that approximately 70 percent of all heat loss in a body of water is due to evaporation. It’s common for suppliers to recommend that the surface area of the panels equate to 80 percent of the surface area of the water. panels up to 100 or 120 percent of surface area. By contrast, there are situations, especially in warm climates, where systems can be sized as low as 50 percent of water’s surface area. of some type of solid cover, whether a floating solar cover or a solid safety cover. Simply preventing evaporative losses using a cover will typically more than double overall system efficiency. As a side note, when systems include fountain elements or waterfalls, which can dramatically add to evaporative losses, many installers and manufacturers will recommend upsizing the panels to compensate. most staunch solar heating advocates will admit that the systems may not be worth the cost and will most likely only lead to unsatisfied customers. mounted when facing within 45 degrees of southern exposure. Otherwise they will only be in direct sunlight during the summer months, when heating is less of a concern. East and west facing exposures can still be effective, although they could require upsizing or moderated client expectations for performance. Systems installed on flat roofs are perfectly acceptable.